ONBOARD THE AMASONATA-Remember the time when taking a cruise meant living for a week in a room the size of a travel container for your pet? When getting to the head meant first moving your suitcase out of the way? I do. Our stateroom on the third level of our AMAWaterways riverboat is, in Trumpian terms, H-U-U-G-E. When my husband and I took possession of it this afternoon we felt like we were moving into a suite in a five-star hotel. Taking a cruise on one of the modern boats that ply river waters all over the world these days bears no resemblance to ship experiences of the past. My memories of life aboard a ship include the Mediterranean cruise we took in the 1990s when we were assigned a claustrophobic cabin under the bow. My husband, who spent his youth on the sea racing sailboats, woke up seasick from the all-night rolling and was miserable for the next two days. Modern riverboats are so stable you don’t even know they’re moving. On past cruises we’ve been given staterooms so small that one of us had to lie on the bed to give the other room to pass. You could almost touch the four walls, and the ceiling as well, by standing on the bed. I can remember cabins without any portholes or windows. It felt like we were inside a coffin. Floor-to-ceiling sliding glass doors like the ones our stateroom has? I can remember cabins that scarcely had a porthole or a ray of light, much less the glass vistas our cabin presents. We’ve been on ferries that spewed enough diesel to cause black lung disease. On riverboats there’s never even a whiff of exhaust. 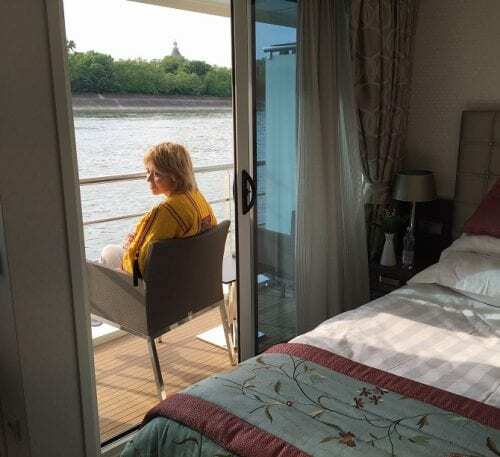 All these past experiences are why — entering our enormous AMAWaterways stateroom –- was such a pleasant surprise. It wasn’t just the queen sized bed, or the twin balconies where we can sit outside with a glass of wine, or the granite-topped dresser with the flat-screen TV, or enough closet space to make California Closets jealous. This one has a little alcove with two easy chairs and a table in it. We feel like Hungarian royalty here on the Danube outside Budapest. Oh, and the bathroom? 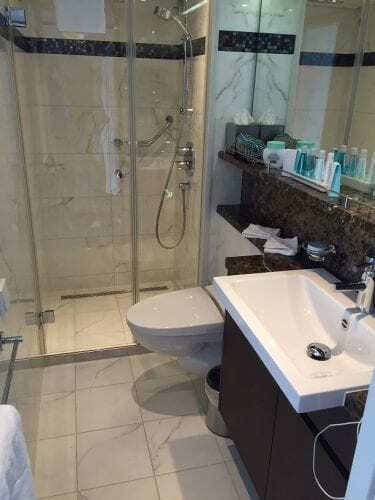 This one is Waldorf-Hotel enormous, with over-the-sink shelf space for everything in your toilet kit and more, and an ultra shiny shower, big enough to hold more than one adult (if that’s your fancy). 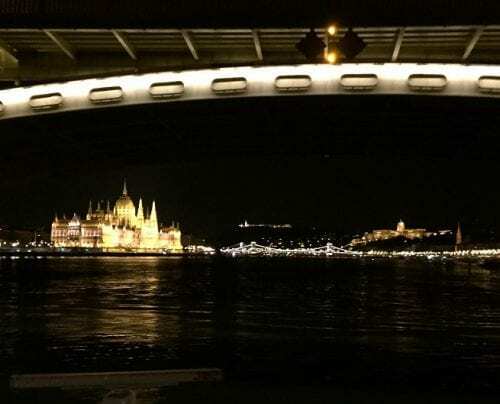 At the captain’s suggestion we left these luxury living quarters at 9 p.m. to go topside on this chilly April night as the Sonata began its cruise down the Danube out of Budapest, whose ancient government buildings were bathed in spectacular golden light. The Hungarian Parliament looked like a giant wedding cake for a princess. Hard to believe but the Budapest light show was even more spectacular than the sight of the illuminated Eiffel Tower the night we left Paris last August on the start of another AMAWaterways cruise, this one on the Seine River to Normandy. Awestruck, we watched the lighted buildings drift by as we stood on the deck enfolded in blankets provided by the ever-solicitous crew. The blankets, to our amazement, had all been pre-heated.